Coco 250 : Team Aggress! I’ve had been contemplating this race, was anxious and nervous since I had never done a multi-day self-supported mountainbike event. Once my friend Dave Wilson from El Paso completed my custom bikepacking bags, I was totally in, better yet, he was also in and we decided to do it on our singlespeeders. Two trial run overnighters to Parker Canyon lake, and I was dialed in. My total setup was around 45 pounds. My father hooked me up with an ultra-light downbag for my Bday, which eased much of my anxiety. We decided to roll out at 6:30 instead of the 7:00 a.m. meeting time at the “The Place, ” a family restuarant in Flagstaff. We made our way to the FUT’s and began our roll towards Fisher Pt. The ride along Andersen Mesa was just as you would expect – bumpy…but soon we descended down the swoopy fun section of the AZT across Lake Mary Road and picked up the trail on the other side.Shortly after leaving FR240, we passed on toping off with water at the ADOT yard and road some gnarly singletrack into trail. Dave spoke about the awesomeness Hangover Trail we were bypassing on the route, got to go back for that one. 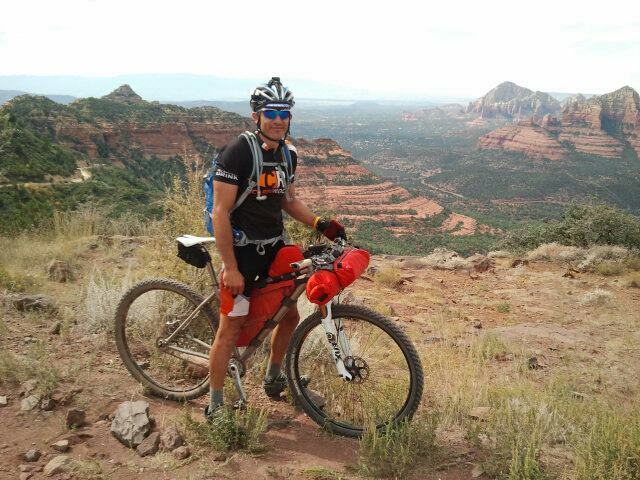 After fueling up at the local Circle K, we pressed on to enjoy the super fun singletrack of Sedona. After paying our Red Rock State Park fee, it was on to Lime Kiln Trail.Ah yes…Lime Kiln Trail… Having never rode it before but hearing stories, I was somewhat prepared for what followed…HAB up a steep ridge in the beginning, deep sand in the middle with at times a very faint trail, followed by a fun, ledgy descent into Cottonwood, riding with the last hour with our night lights. All in all, great fun, but damn, I never knew the Verde Valley was such a WIDE valley…whew. After we arrived In Cottonwood, we had a time sucker, finally navigating to a local store/grill. It was our last refuel stop before heading up Mingus and the long haul to Williams. I tanked up on as much water as I had capacity for (about 180 oz) and enough food to get me to Williams. We road 1000 feet above Mingus and took a 3 to 4 hour nap. At approximately 1:30 a.m. we proceeded up the mountain. Initially, the climb wasn’t bad; sitting turning my 32×22 was easy.Then it got steeper…where standing turning a 32×22 was about perfect. Then it just got silly steep…no way I was gonna burn my “glycogen matches” trying to muscle up the steep grade.So off it was, walking my way up Mingus Mtn. Occasionally, the grade would lessen and I’d hop back on until finally hitting the single track. Oh boy….the single track up Mingus…technically, I guess you would call it single track, but holy crap, quickly turned into something only suitable for acrobats and mountain goats. There were times when it took every bit of effort to heave the bike up and over the next big boulder, then squeezing the brakes while I then heaved my body up. This “bike-body ratcheting” exercise continued for what seemed like an hour. During this wicked HAB sufferfest, I swear I saw Jesus three times and maybe even a few of his disciples.Finally, after scratching my way up this rocky, overgrown excuse for a trail, I hit the top where some useless a-hole decided it would be fun to litter the now-level-trail with tons of babyheads. At this point, my “chunk avoidance system” was shut down for maintenance as I was the ball in a life size pinball game. FINALLY, it was game-over! My L&M Stella descent down Mingus was crazy good…big wide, banked switchback turns in between which were smooth sections of bench cut trail begging to be ridden fast.I then made my way north, along a rocky powerline access road which must have been a goathead farm at some point.I kept hearing a “tink-tink-tink” sound as a goat-head stuck in my tire and hit the frame with each tire rotation. Thankfully, I emerged from that unscathed. Before the big downhill of the Verde, you slowly climb along the north end of Mingus Mountain on what is actually a very enjoyable dirt road. It meanders in and out of several drainages until finally, you make a left turn and become a human torpedo due north to the Verde River. I was could not match Dave’s speed, his momentum (6’5″) and fully loaded rig, I swear he reached 60mph. At the Verde, we crossed the bridge and found a nice spot to access the river where we proceeded to filter 3 liters of water. It was a very serene spot with the river flowing, big shady trees that were just begging to have weary bodies lying beneath them. We then left with about 130 oz of water on board hoping that would get us up the never ending ascent to Williams. Grinding up that road, it was mostly ride-able with the exception of a section where you pass a layer of flagstone. The road then became steep and loose, which together equals HAB on the SS. The climb is nothing short of brutal – false summit after false summit until finally, the presence of Ponderosa pines signals you are nearing 7000ft. From there, We continued north on the getting an occasional slap in the face with another small climb as the road undulated along the landscape. Finally, we reached the Benham trail that leads you up the south face of Bill Williams Mountain. This well built trail would be a treat with some fresh legs and an unloaded bike- two things I did not possess that day. Finally, down we went, hands death gripping the brakes, down some steep, relentless, never-ending water bars. I swore there were over 1000 of them suckers. I had to stop twice to get the feeling back in my hands and feet. Rolling into Williams, collecting my thoughts and thanking God I cheated death one more time. Williams provided some delicious pizza on Route 66, then off to Safeway to refuel after some cross town navigation errors. The long day (or two) in the saddle was starting to take a toll on both of us, yet knowing that we had approximately 70 miles to go kept those pedals cranking. We agreed to lay down for the night on a nice peaceful FR one hour from Williams after 19 hours in the saddle. We discussed the fun factor and how a good nights rest would contribute. Refreshed and excited we rolled out at 4:30 a.m in an uber chilly roll down to Sycamore Canyon. I could smell the finish…even though it was 40 miles ahead, I had strong legs and thought of finishing was as though someone had just sold me his spare EPO shots. We proceeded to have a great time riding the chunk of the Sycamore Rim trail, picking our way at dawn through the lava rock. Finally emerging on the powerline trail, we then hit the roads that led us to the Texaco, our last refueling spot, a nice cold frappo and cheese danish, yes!! We pressed on with the Wing Mountain moto trails, rutted, loose cinder grooves down to hwy 180. Then up the FR151 climb and steady rhythm going up FR151 with great anticipation of the upcoming descent down the AZT, funnest descent in Northern AZ, gripping and ripping that single track that I’d ridden a couple of times before. Even with a weighted bike, I tossed it around those turns as though it was a feather. We were having so much fun that we missed a couple of turns, little frustrating when you are having so much fun, yet the GPS tracks were not 100% accurate. Finally, merging with Schultz Creek trail, we continued as fast as we could railing the final turns and eventually hitting Quintana Rd. My father was waiting for us at the finish with a huge smile (old school cowboy who understands the backcountry adversity). We were the first finishers and I was more than stoked to have finished my first bikepacking adventure. Dave was a huge inspiration and his company definitely made this all worth while.